Comments: May have some shelf-wear due to normal use. Includes original disc(s) in original packaging. If a disc you purchase from us does not play correctly, just let us know. This deluxe course has everything you need to learn French from scratch or to revive the French that you learned years ago. "Ultimate French "combines conversation and culture in an easy-to-follow, enjoyable, and effective format. 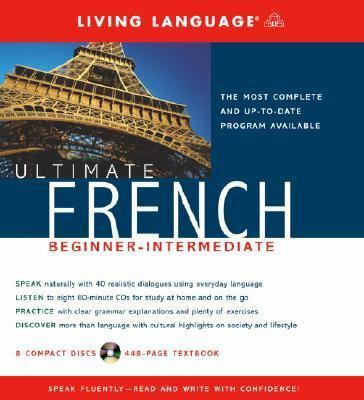 It's the perfect way to learn French for school, for travel, for work, or for personal enrichment. In this book you'll find: - 40 lessons with lively dialogues including the most common and useful idiomatic expressions.- English translations and explanations of French grammar and usage, pronunciation, vocabulary, and culture notes.- Quizzes and review sections to check your progress.- A complete summary of French grammar, and verb charts covering all major tenses.- A section on letter writing for business or social occasions.- An extensive two-way glossary.- Up-to-date computer and Internet vocabulary, information on euros, and more!Living Language Staff is the author of 'Ultimate French Beginner-Intermediate', published 2004 under ISBN 9781400021055 and ISBN 1400021057. Loading marketplace prices 5 copies from $55.77 How does the rental process work?